We take a gamble and leave the bosom of Birmingham for the evening. We head for Warwick Arts Centre, just outside Coventry, with our A-level thinking caps jauntily atop a furrowed brow. 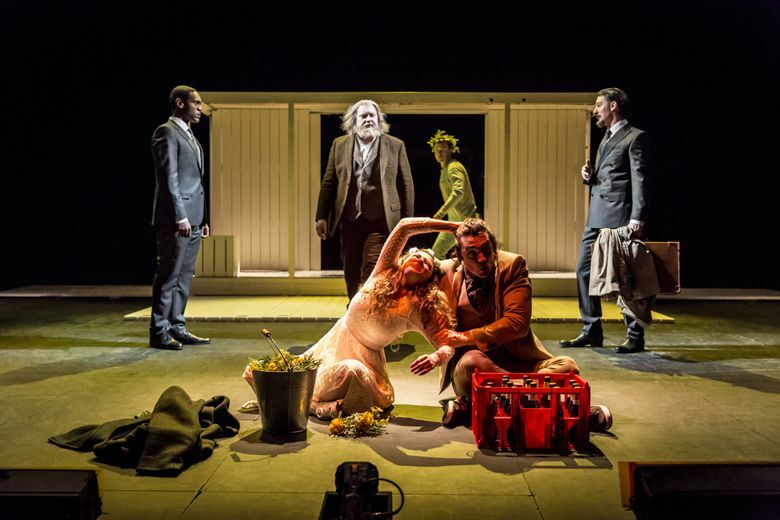 Off to see The Winter’s Tale, a tricky Shakespeare story that delivers more questions than answers (quick now: a 500 word school essay by tomorrow on the powers of a second chance… And the weight of guilt). This is late Shakey. And we have a theory as we watch theatre company Cheek by Jowl’s tense production of a dense play. The playwright, ageing and about to put his feet up, wrote a lot in this era about fathers and estranged daughters: The Tempest, Cymbeline, Pericles and this one, The Winter’s Tale. Was something niggling at him? Something happen back in Stratford with his own pair of daughters? Was he wounded by paternal remorse? We wait for the discovery of Will’s secret diaries hidden for 400 years behind an old sofa. Cheek by Jowl is touring the world with this deeply penetrating play about a king who suspects his pregnant queen of adultery. Their newborn daughter Perdita (‘The Lost One’) is whisked away and secretly raised by bucolic shepherds. Then comes re-union and deep redemption. It’s heavy stuff. Orlando James expertly handles a king gone mad on unfounded jealousy. And Natalie Radmall-Quirke is shattered but dignified as the wronged spouse. The twisty story is renowned by Those That Know These Things for its fragmented speeches — probably written to reflect the inner mind of a husband gone crazy with unfounded sexual doubts. The actors use a successful staccato style at times to try to make sense of this tortured inner dialogue. And it works. We stumble out into the wet night. The language is heavyweight, the ending profoundly poignant, lit by candles, touched by a minute hint of music and redolent with the dream of a second chance as king and queen are re-united and their lost daughter blessed with a family once again.